9 Before the bridge NCO sends the last Marine to cross, they must make the bridge retrievable. b The first step is to break down the mechanical advantage, ensuring the braking knot is set before doing so. The system will be broken down until the bridging line is attached only to the brake knot. 9 They will now take the rope around to the back of the anchor, and tie a slip figure 8, with the loop of the slip 8, take it and attach it to the bridging line just in back of the braking knot with a 85.
d Now pull the running end coming out of the slip 8 until it tightens, and bites on the rope. 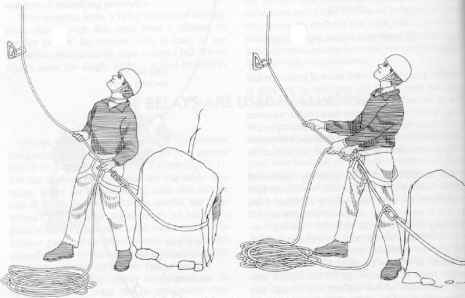 Once the rope bites, tie a thumb knot behind the slip 8 as close to the slip figure 8 as possible. 9 The bridge NCO, with the help of another Marine, will now untie the swammi wrap, until all of the tension is on the bridging line. f. The safety line will now be brought up, and attached to the end of the bridging line with an overhand knot. H The bridge NCO and the other. Marine will now cross the bridge. NOTE: It is possible that the bridge may lose tension after breaking the bridge down. The packs of the last two Marines across can be sent over with other Marines, prior to the slip figure being tied. After both Marines have crossed, the safely line will be brought up from down stream. i| The tree wrap will now be taken off. Once the tree wrap is off, all knots and carabiners will be taken out. H The safety line will now be pulled, the bridge is retrieved. TRANSITION: When in mountainous terrain it is important to be aware of the fact that you may encounter a great variety of terrain in a very short time. Employing a rope bridge is a very worthwhile skill. Are there any questions over the retrieving the bridge or any thing covered in this class. If you have none for me, then I have some for you. How to build a retrievable rope bridge?